Love him or hate him, you cannot deny that Cristiano Ronaldo CR7 is incredibly successful in the world of football and beyond. His salary and endorsement deals have given him a net worth of well over 400millions EUR (2017). His ability to capitalize on his skills and his marketability along with his confidence, drive and passion are a source of inspiration. In 2016, Ronaldo was the third athlete ever to sign a lifetime endorsement deal with Nike. The other two athletes are Michael Jordan and LeBron James. However, Nike sponsored him since 2003. Cristiano Ronaldo CR7 has worn more than 60 different football cleats. The Nike deal is expected to earn Ronaldo over one billion USD in his lifetime. This is the largest ever sponsorship deal in the world to date for a sport star. 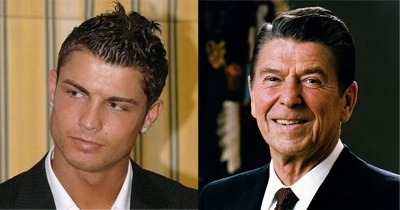 He was name after Ronald Reagan who was President of the United States of America during the year of Cristiano Ronaldo’s birth, namely 1985. His parents made this decision because they thought that the name sounded strong and he was the favorite actor of Ronaldo’s father. FNC is the IATA code for the international airport of Madeira Island. It was commonly known as Funchal Airport or even Madeira Airport. However, the official name of that airport situated in Santa Cruz was Santa-Catarina Airport until Spring 2017. Following CR7’s success with the Portugal National Team in 2016, Madeira’s government decided to change the name of the airport. On March 27th, 2017, the FNC airport officially received the name of “Aeroporto Internacional de Madeira Cristiano Ronaldo”. 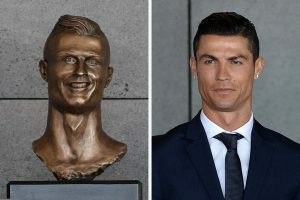 The President of Portugal unveiled a bust of Cristiano Ronaldo CR7 to commemorate the inauguration. 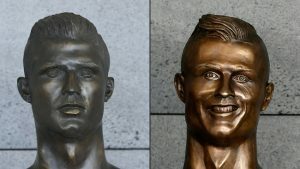 The bizarre bust caused quite an uproar and was secretly replace over a year later. CR7 – Facts, Figures and Trivia – Part Two is here and part Three is here.